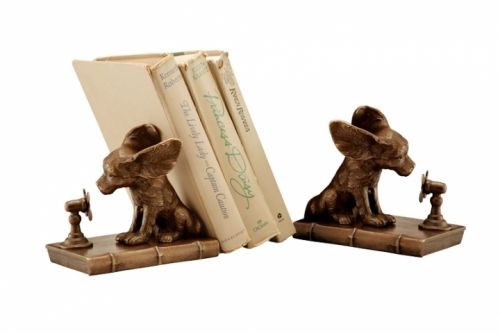 These charming Cool Dog Bookends are meticulously hand finished using the hot patina technique, the same method used in works found in the finest art museums. This art piece is first applied a cold, chemical patina to the "Lost Wax" cast sculpture, and then used blow torches to heat the solid Brass sculpture to upwards of 250-degrees. While the metal is hot, proprietary formulations of chemicals are applied using various techniques section by section, one layer at a time. Many layers and several hours later, the piece is allowed to cool, and several layers of a special wax are applied. The result is a spectacular, deep and transparent finish with complex subtleties that no other finishing method can achieve. Because every piece is finished individually by hand, no two pieces are ever exactly alike. This art piece is a great accent to any room in your home or office. Makes a great gift item for your family, friends, loved ones, or even yourself.